The arrival of nuclear-tipped cruise missiles at Greenham Common airbase (Berkshire, England) led to huge protests and a long-running women’s peace camp around the base perimeter. This attracted world-wide attention. 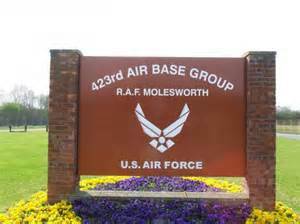 Less well-known, the Conservative government planned to allow the installation of additional cruise missiles at Molesworth airbase (Cambridgeshire), which at the time was disused and unfenced. The organisers of the Glastonbury Green Gatherings – myself included – thus decided to stage our next event at this airbase, on the airfield itself, before any missile-preparation construction work could begin. The Molesworth Green Gathering began in the late summer. Like our other Green Gatherings, it involved camping, entertainments, discussion groups, food stalls and so on. It was billed as a week-long gathering, but in reality we had planned for a permanent settlement to grow out of the event … and to this end had arranged for the Forestry Commission to innocently deliver a large number of logs for construction purposes. Responding to our call for support and involvement, one group of people arrived with a huge black bull called Dharmaraj. Harnessed to a plough, this bovine monster began to carve a nearby chunk of the airfield into long, furrowed strips. A single Ministry of Defence (MoD) policeman had then arrived to see what was going on, since nothing more active than sheep-grazing had happened on this base since the end of World War II. Once a week or so, for the past several decades, an MoD patrol had made a bored circuit in their land-rover, checking that the 876 sheep which had been there last week were still there this week and had not been eaten by any escaped tiger (or perhaps even a leopard) which might be, you never know, out there somewhere. For added spice they usually detoured by a caravan which was sited towards the eastern perimeter, checking that the “rabbit-catcher” – a rather sinister figure who was wont to brandish a shotgun at the drop of a hat – was still living his solitary life and had not yet blown his brains out, nor those of anyone else, rabbits excepted. On that particular day, however, a rather different experience was in store for our security-conscious friend. Already startled by the sight of children playing on brightly-painted wooden swingboats, and already shocked by the scale of our encampment and the sound of nails being hammered as wooden buildings went up, the man from the ministry was nothing short of amazed to see a harnessed bull actually ploughing up his base. For a long moment he stared, open-mouthed, unable to credit his senses …..